Taylor Hidalgo is glad Rock Band was never in arcades when he was growing up. Although I discuss games professionally, I don’t share a lot of it with my family. Many of those close to me don’t have the same kind of relationship as I do. At a certain level, critical analysis of games can simply sound like noise to the uninterested. Meaning can be a strange thing in games; a game doesn’t need to intend to be meaningful. Creating dramatic, meaningful moments isn’t the only pathway. Games that tug at the heartstrings, like Telltale’s The Walking Dead for example, do so as a planned part of the narrative; they are willful and conscious in telling their particular story. 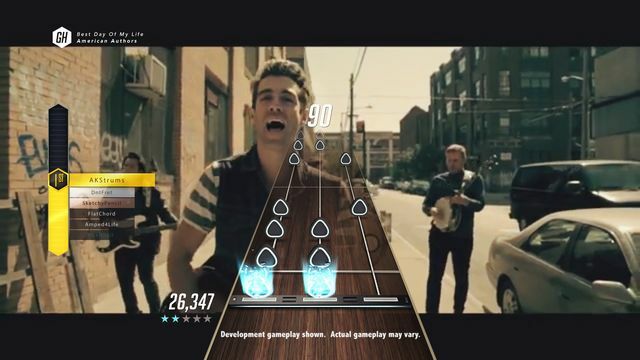 Conversely, games like Rock Band make no significant effort to convey emotional or spiritual meaning. They are mechanical, primarily designed to have challenging inputs and difficult interactions. By design, some games are more meant to be played than to be meaningful, but that does not preclude them being meaningful all the same. Meaning can arise from the actual act of play, from the various interlocking mechanics that make up the grand experience. This can feel a little regressive to say because the concept is so self-evident when applied to any other entertainment. The mechanics of sports like tennis and football aren’t inherently surprising or novel for the audience—unlike Calvinball, the rules and systems backing them aren’t changing as the game goes forward—so the value in the systems doesn’t come exclusively from the mechanics themselves, but the effects they’re having on the people experiencing them. There is emotional drama in watching a favorite team poised on the brink of victory, moments from making a game-winning play. Games like Rock Band aren’t going to send onlookers along emotional journeys—they aren’t designed to, but there is still meaning in play there. Anyone at the edge of their seat while spectating the final round of a poker tournament knows that even if the mechanics are self-evident and simple, there is an emotional narrative for the players. The high of just escaping failure before surging back toward the top of the crowd’s affections is an especially fulfilling one that makes the act of play feel like success over a hardship, even if the hardship is a mechanical formula that’s endlessly repeatable. There is nothing meaningful there, but there is, too. Part of what I love about games of all types—sports, card, board, video, and pen and paper—is that these elements of joy are universal. While a pinball game will likely never be intellectually stimulating on an academic or scholastic level, that will never preclude the desire to fish into a pocket for a quarter and sling a metal ball around the flippers for a run or three. Likewise, no one watching a poker game will need to have a degree in mathematics to enjoy the craft of applied probability. There’s just something there that’s worth being a part of; the emotional highs and lows across the full length of the game are enough to be enthralling in their own right. That’s why I can sit down with my immediate family behind the goofy, childish, intellectually silly pieces of plastic that are, at best, crude facsimiles of instruments and have an absolutely enrapturing time pretending that I’m a musician on stage. Rock Band gives me the opportunity to make believe, in a very nuts and bolts kind of way, that what I’m doing is meaningful. Because it is. The click of plastic and muted pomfs of drumsticks on rubber aren’t anything like playing an instrument, nor do the color-coded tabs on the screen remotely resemble the intricacies buried in the bars of sheet music, but they’re still powerful. Getting to be a part of that kind of experience carries its own meaning, in a way that words can never really describe. Although I have a professional interest in viewing games not just as regulated rulesets set to pretty pictures and fancy soundtracks, it can be just as meaningful to recognize that how fun it is to simply play the game without the need for any higher intellectual pursuit attached is also important to the whole experience. When I get to share a game like Rock Band with the people close to me who may not have the same taste in pursuits as I do, I get to share that part of myself with them. I get to illuminate, through some goofy, childish, silly piece of entertainment, a facsimile of the things that enrapture my imagination. Games go from something largely uninteresting, goofy, and noisy to an experience that can be shared for how much elation and excitement they can bring. For as much as games can be loved as an art form, they can also be loved as a piece of indulgent entertainment. So, it’s worth sometimes sitting back and fiddling with a silly piece of plastic shaped like a bass guitar and strumming along to the Beatles. Games don’t have to have meaning to be meaningful. Taylor Hidalgo is a writer, editor, and Features Editor for Haywire. He’s a fan of the sound of language, the sounds of games, and the sound of deadlines looming nearby. He sometimes says things on Twitter and his website, and has a Patreon if that’s your thing.